You might remember me mentioning that I was having a hard time finding a dress from Alex‘s wedding and after vetoing the dress that I had because it would take up too much room in my suitcase I was on the hunt for something new. I wanted something flowy and lightweight because it was going to be hot and humid in Kentucky, and something in a bright fun print. 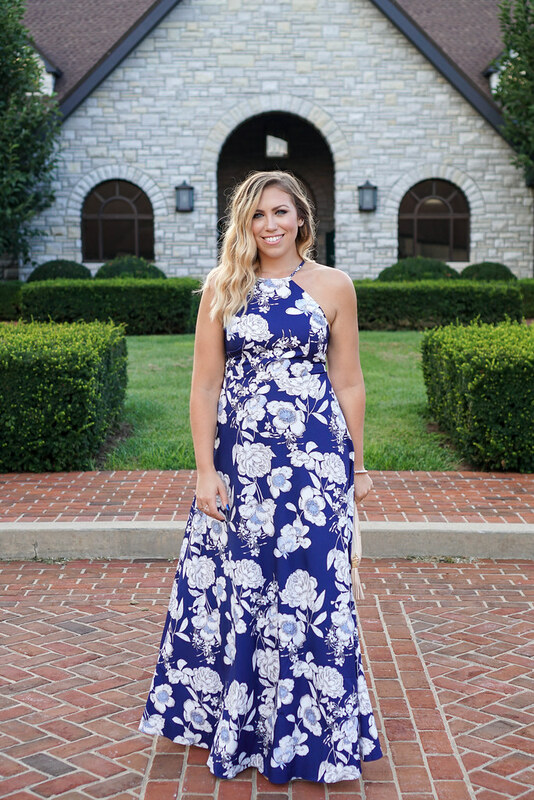 I was initially looking for a midi length dress, but once I saw this maxi I was sold! I ordered it (along with a few other items that will be up on the blog soon) and once it arrived I knew it was perfect! Something about it just screams southern wedding attire and you know I can’t resist a good floral print! The best part…it’s under $25 and would work perfectly for any Fall wedding you may have on your calendar! If you have any upcoming weddings I highly suggest going to maxi dress route! And when you go with a maxi no one will know if you’re wearing heels or not!